Lack of unity among these parties opposing the Nazis proved fatal. 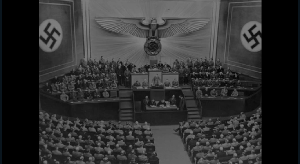 The National Socialist Party was in power. They made many claims and many promises. The German People had embarked on that long, incredible journey that led seemingly out of chaos unprecedented triumph. Promise after promise had been fulfilled. Austria 1938, Czechoslovakia 1938, Poland 1939, Norway, Denmark and France in Quick Succession. A place in the sun at last. True, they had lost their trade unions and a lot of books had been burned, but it seemed a good sort of bargain, and one got to like being told what to do having one's views prescribed, especially if it meant a vista bright with the promise of grandeur and conquest.